Imagine a 35-foot vintage Harley-Davidson cruising on busy city streets. This is happening in Tulsa, Oklahoma. For the remainder of 2016, Douglas Henderson’s photography of a 1948 Harley-Davidson Flathead, equipped with the historic Panhead engine, is massively displayed on a Tulsa Transit bus. This large-scale form of public art is running on Tulsa’s streets 14 hours a day, six days a week. 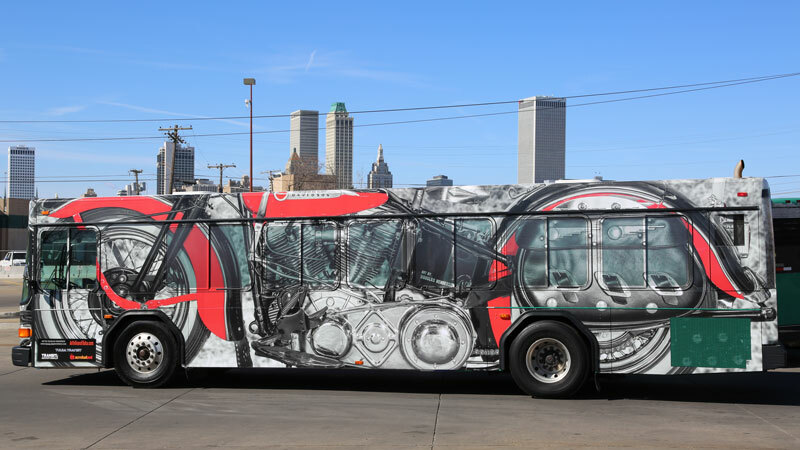 The third annual Art In Transit Tulsa contest, in partnership with Tulsa Transit, Transit Advertising, Inc., and Acrobat Ant, called for Oklahoma artists to submit bus designs for a chance at their design being showcased on a transit bus for one year. Out of nineteen submissions, Henderson’s photography was selected and is now bringing public art to the urban landscape. As a world-renowned professional photographer he saw the contest as a way to stretch his artistic and graphic design ability. The owner of this now famous Harley-Davidson wishes to remain anonymous but the details of the bike are on full display. 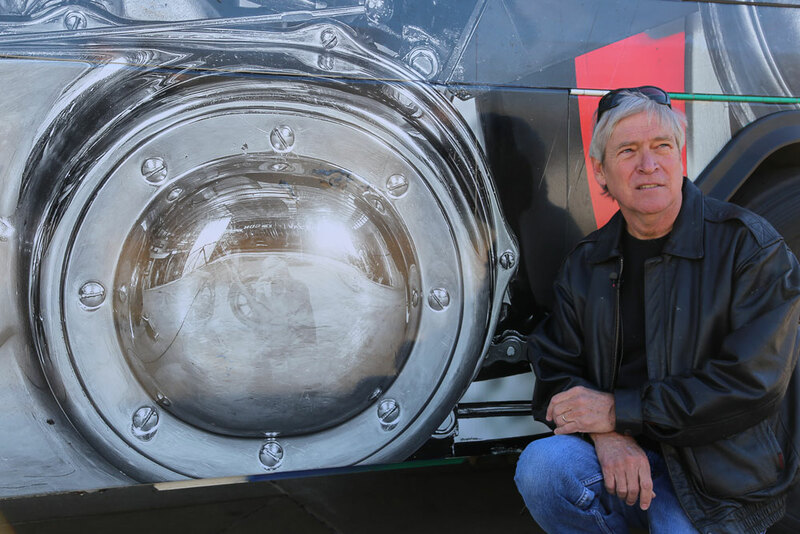 As an Adobe Certified Expert in Photoshop, Henderson used his artistic skills to add details of Tulsa’s skyline and Tulsa Transit’s downtown station in the reflection of the motor’s air cleaner. The saddlebags have ‘Art In Transit’ digitally etched into the rustic leather and, if one looks close enough, a self-portrait of the photographer can be seen in the engine. Myers-Duren Harley-Davidson of Tulsa hosted the unveiling of the bus on February 16. Tulsa photographer, David Maloney, came to see the bus in person. Henderson and runner-up Randy Riggs also have their work displayed on Tulsa Transit bench and shelter bus stops. Our team printed and installed the art onto the bus, shelters and benches. It’s exciting to see the creativity submitted by our fellow Oklahomans for the Art In Transit contest and we were thrilled when we saw the winning design. Installing this design on a Tulsa Transit bus brings a recognizable piece of American tradition onto a much larger scale. Transit buses provide a large versatile canvas that can transform any message, advertisement or image into moving art. All the bus stop designs can be viewed at the following locations in Tulsa.